Setting out initially to cover the largely uncovered section of IFD's history (check out the Wolfen Ninja review for a basic breakdown of their history and practices) concerning their presentations of complete gems from late 70s/early 80s Taiwan fantasy- and exploitation cinema, in reality what is also sadly unmentioned when bringing up their famous/infamous Ninja cut & paste productions often starring Richard Harrison is that some of the mixtures of an older Asian movie with newly shot footage with Westerners inserted is that some of them were actually good! Good from both Joseph Lai's and Godfrey Ho's camp and the original movie underneath. Or it was the case of IFD spicing up a completely unrelated movie so well, both movie A and movie B if you will thrived. For sure, many of IFD's Ninja movies and the likes were chores though and essentially only coming to life when Richard Harrison's or Pierre Kirby's scenes got showcased but this continuing coverage and onwards will still focus on when IFD formula was golden not only for the market looking for anything Ninja-ish or bearing the IFD logo. Ninja Avengers is a curious example where some versions are not featuring ninjas at all essentially! To explain, Ninja Avengers is the IFD presented version of the Taiwan martial movie Fury In Storm (Hsu Chin-Liang, 1974) starring Chang Yi, Lung Fei and Patrick Kelly but when the British Board Of Film Classification got hold of it, it changed substantially. Meaning it was, according to Internet Movie Database, stripped of all the ninja scenes when released as Ninja Operation 6: Champion Of Fire in the UK (ironic when the titular characters are nowhere to be found. Shaolin Quick Draw was another dvd release title in the US). What was actually left was a wonderfully poor opening with British-Australian actor Stuart Smith (one of IFD's frequent leading men and the only one who acted with his mouth... truly) looking mighty pissed (that he's not in the movie more?) and some of the ugliest white dudes ever to grace an IFD flick. No ninjas and no more Smith. 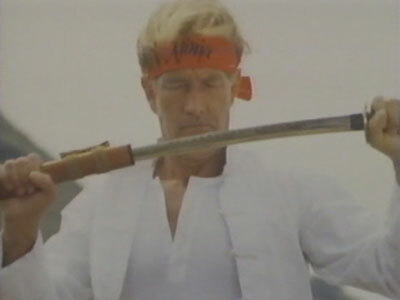 In fact, the bare ninja reference left came during a 30 second Richard Harrison scene but no fighting takes place. So therefore running 13 minutes or so shorter than it should, for re-review I've been able to locate the uncut version that needed to feature a coexistence between the original and IFD's re-structure of it in order for SOME fun to come through. It only makes matters marginally better because Fury In Storm by evidence presented here in truncated form is a boring East meets West road trip that thankfully is hijacked by the standard beats of IFD's direction. Priceless Stuart Smith acting and line delivery at the start all too quickly leads into the Fury In Storm footage and unfortunately it does take up way too much of the running time, with very few breaks with Harrison and company (in fact Smith only turns up at the end fight after this opening so it's a short co-starring role). I say that because Fury In Storm can't work up any storm or barely any energy for that matter. 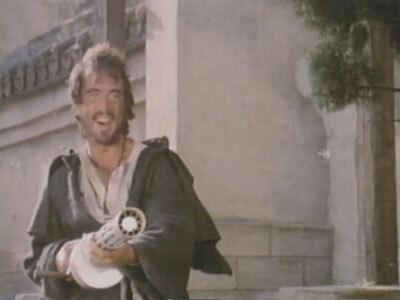 Patrick Kelly's priest character with his big cross going wherever he goes is not out of the standard kung-fu movie template, which is admirable and the movie is one of those early examples of an East meets West aura with a tinge of the Western genre injected (making this have more in common with the Lo Lieh/Lee Van Cleef vehicle Blood Money and The Fighting Fists Of Shanghai Joe). Aside from the ending being fairly atmospheric in the tradition of the best Westerns, the momentum largely stops at the knowledge of these genre intentions. The action choreography is sluggish, Chang Yi's welcome good guy role is a character that fades into the background easily and you clearly miss him being made-up in white hair and being a fighting villain because in terms of fighting talent, Chang Yi is reliable usually. The flirting Antonio in Kelly's hands is a nice sight for the genre but not a pretty character to watch who's in the game only for selfish needs to the point where he's having no problem (and way too much fun) slapping women around for his own means. It's made more distracting because Kelly is a hammy actor without restraint in several moments and it's only the reveal that he was carrying a gatling gun in his cross that makes anything connected to Antonio fun. Having said that, IFD's footage is its usual self, working from a directorial template in terms of storytelling (including having dialogue scenes with the other movie) and action, it's embarrassingly familiar (meaning it clearly didn't need to be shot specifically for this movie. Take any of Richard Harrison's scenes shot on the hills and Ninja Avengers could've been, and probably was, used in another movie). But we get 13 minutes of goofy fun featuring dedicated "actors" outside of an usually tired Harrison trying to inject a little life into Ninja Avengers. Its lasting legacy will be certain elements from Fury In Storm too but it's a standard cut and paste product where at least 13 minutes ARE good/bad fun.